Cleaning your upholstered sofa or other upholstery is not just vacuuming them from time to time. What you need to do is have them deep cleaned at least once or twice a year. If you are not cleaning savvy and are not sure how to perform such a job you can call our company and hire our professional upholstery cleaning service to get it done. We are a cleaning agency and we guarantee you a very efficient and convenient upholstery cleaning service. We are a dependable and very experienced company and we can give you a hand with the cleaning of any kinds of upholstery – sofas, all types of chairs (dining, office, stools and ottomans), mattresses, curtains and blinds, etc. 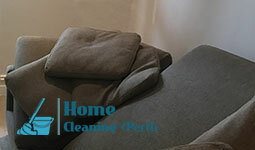 Trust us and call us now, we are available in Perth and the surrounding areas. Our cleaning teams are equipped with cleaning products that are different for the different types of fabric – acrylic, nylon, polyester, etc. We can guarantee you a safe and adequate upholstery cleaning. We can clean the upholstered furniture in your home or your office at very reasonable prices and customised packages. Our company’s number one priority is our customers’ satisfaction and we will make sure that you are happy with your results too. Our cleaning team will arrive on time, fully equipped and will get to work. They will inspect your problematic furniture, they will pre-treat stains with the right detergent, then they will steam clean the entire upholstery. After the cleaning is done they will deodorise the area if necessary. What we can guarantee you are an efficient result and a brand-new looking upholstery. Whether it is your office chairs, curtain and blinds, your living room sofa or any other upholstered piece of furniture that you need to be cleaned, we will clean it. We are the best in Perth, call us now.